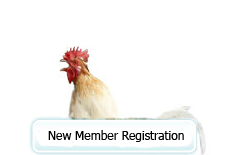 If you are a already an AAAP Member, please login to renew your membership. Associate Member: May be (a) a USA resident veterinarian and not a member of the AVMA, or (b) a person from the United States, Canada, Mexico, Central America, South America or the Caribbean Islands who does not have a degree in veterinary medicine who is involved in or has made contributions to the field of avian health. International Associate Member: A person residing outside the United States, Canada, Mexico, Central America, South America or the Caribbean Islands who is engaged in some phase of avian diseases. Student Member: A person who (a) is enrolled in a veterinary medical degree program, or (b) is enrolled in a master's degree, doctoral degree, residency or intern program. Membership will continue to the end of the calendar year of graduation at which time the student member must apply for conversion to the appropriate membership status. (1) The candidate must have been active in the field of poultry health for a minimum of 25 years. (2) The candidate must have made significant contributions to the American Association of Avian Pathologists. Examples of significant contributions are serving on the Board of Directors, and/or serving on committees of the AAAP such as the Editorial Boards associated with the AAAP (Diseases of Poultry, Avian Diseases, Isolation and Identification of Avian Pathogens, etc. ), awards committee, and/or other committees essential for the AAAP. (3) The candidate must have made significant contributions to the field of poultry health. Equal weight will be given to criteria 2 and 3 in the decision to elect the candidate to life membership. Honorary Member: A scientist who has made unusually significant contributions to the field of avian pathology. Not more than two honorary members shall be selected in any one year. An honorary member shall not be required to pay dues.